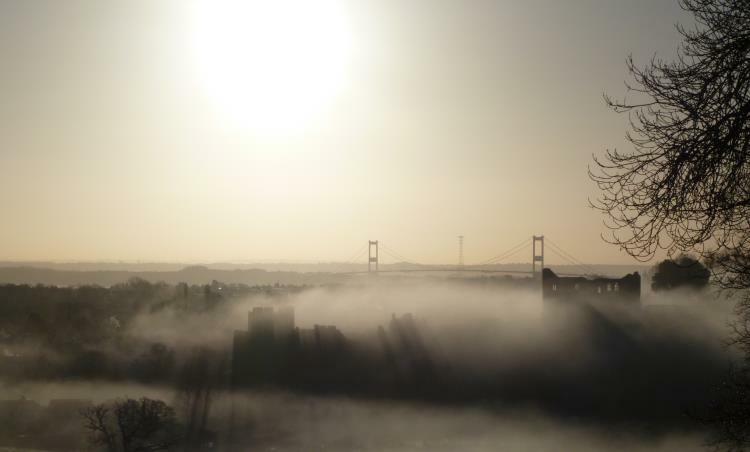 This circuit begins in Chepstow, and starts on the west side of the Lower Wye gorge, passing the Piercefield estate and Giant’s cave; the 365 steps and Eagle’s Nest; Tintern Abbey; a stretch of Offa’s Dyke including the Devil’s pulpit; Wintour’s leap; and Chepstow castle. I think this circuit is amazing, with fantastic viewpoints. It is long though, and there are two steepish ascents, some parts can be muddy, and there may be wet stones and tree roots. If this sounds too much it is possible to take the 69 bus up to Tintern, and then walk back along either the western or eastern side of the river. Key Features:Manmade features include the whimsical structures in Piercefield park, as well as the more serious ones of Tintern Abbey and Chepstow Castle. The natural features of Eagle’s nest, the Devil’s Pulpit and Wintour’s leap provide spectacular viewpoints. Refreshments: Various pubs and cafes at Chepstow and Tintern. 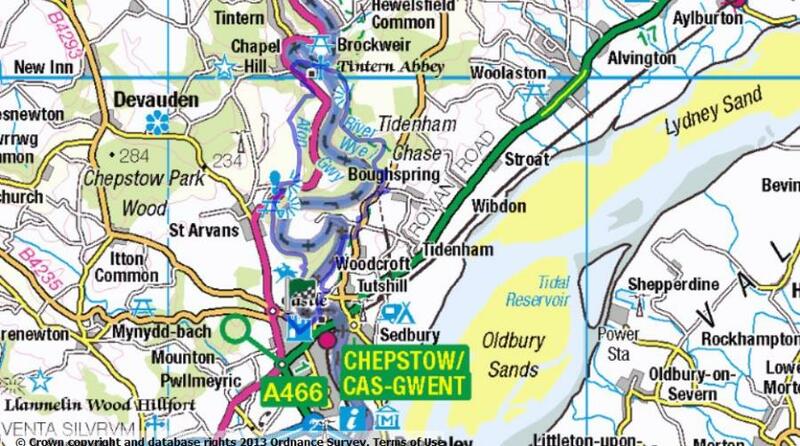 This route follows the Wye Valley walk up the western side of the Wye, crosses over the river at Tintern and then ascends to Offa’s Dyke, following the Offa’s Dyke path back to Chepstow ( except for one short dangerous section on a fast road, where an alternative route is described below). It also includes elements from three other walks: A9 – The Lower Wye gorge – western circuit; A10 – the Lower Wye Gorge – eastern circuit; and A7 – a steep climb to the Devil’s pulpit, so you may want to look at these for photos, links, and more detailed information. Here I’ve summarised the relevant sections from the other walks in italics, and also provided details of changes/deviations from the Wye Valley walk and Offa’s Dyke path, as well as describing any new bits! This walk begins at the Leisure centre in Chepstow. If you walk away from the Leisure Centre building through the car park you’ll find the Wye valley walk is signposted on your left. Follow the path, through a wall and right down some steps. You will eventually reach ‘The Platform’ (you will know it when you get there!). About 150 yards after ‘The Platform’ where the trail branches, you should bear right. Continue to follow the Wye valley path markers, past the grotto, and looking to your right for glimpses of the cliffs on the opposite side of the gorge. When you come to a point where a path indicated by yellow arrow goes off to the left, you follow the permitted path indicated by a white arrow, on the right. Continue to follow the permitted path, signed with white arrows. Just after you emerge from the Giants cave ( the tunnel), there is a small path to the left – ignore this and keep right, continuing until you come to a car park. Here you cross over the A466, following the signs to ’365 steps’. Continue to follow these signs, wending your way between intertwined yew trees and rocks. Most of the stretch is stone steps, but towards the top a metal staircase has been installed to help people get up a rock scramble. You continue to follow the Wye Valley walk northwards. There has been a change of route in the section just above Tintern, the bit that takes you from the woods and across Reddings farm. This is well signposted, but won’t show up on most OS maps. When you walk into Tintern, turn left along the main road, then cross the river just after the tea room and craft shops. A short distance after the bridge turn right along the disused railway track for a couple of hundred yards and then turn left up a stony path. When you reach the section where the path goes over a railway tunnel (there is a low stone wall on the left hand side of the monks’road at this point), turn sharp right following the signed path to Offa’s Dyke. After a few yards the path forks, and you bear right towards Offa’s Dyke. Continue for about another 20 yards, and you will see a path going more steeply upwards, on your left. This path is indicated by a yellow marker. This is the original way to the Devil’s Pulpit, as you will see from the stone steps you’ll come across later on. Until recently the official signposts directed visitors along broader and more gradual paths, and so the old path has become somewhat neglected. You will eventually arrive at a forestry track, where you go right for about 5 yards, and then turn left at a path signposted to the Devil’s Pulpit (about a yard past this sign is mossy old stone signpost, and you can just about make out some of the letters). After a few yards turn left again, and continue along this path until it crosses over Offa’s dyke. Turn right here and follow the Dyke (the earthen wall of the Dyke is on your left, and you are walking in the ‘ditch’ part of the structure). You will know when you’re coming close to the Devil’s Pulpit, because the path has been restored by the AONB. Continue to follow the Offa’s Dyke path. It eventually emerges onto a fast road. To begin with you can just about get along safely by using verges and a short stretch of pavement, but the last part of the road section is on a steep bend with poor visibility and no verges – so it is best to go down Boughspring Rd – which is on your left just before the bend. Not far along you will see a sign for the Gloucestershire way on your right, and you take this path. Follow the white arrow across the field. You will come to two metal barred gates – and you can take either ( it was not clear which the official path was supposed to go through!). The second field widens out and on the far side you will see a metal kissing gate. Go through this – and you will have rejoined the Offa’s Dyke path, which you follow into Chepstow. When you get to the Castle, take the path to the left of this. When you reach a road, turn right and walk along for half a mile or so, and you will find yourself back at the Leisure Centre.